What Is A Smart Scale?- Is It Worth The Investment? With the ongoing advancements in technology, it seems like everything is “smart” these days. Phones, watches, refrigerators, even bathroom scales. But what is a smart scale you may ask? Well, by definition, it’s a scale that can communicate with an app for tracking different data. Does this really sound like something you need? Is it worth paying for? Well, maybe. First let’s take a look at what smart scales can really do before we answer that question. My definition above was a little cut and dry, I know. I guess a better definition would describe what a smart scale is really recording and what information it’s sharing with that app. Like any other “smart” device, a smart scale is able to automatically track and store it’s data with an internet based system. Usually an app on a smart phone, but also through a website on a computer. 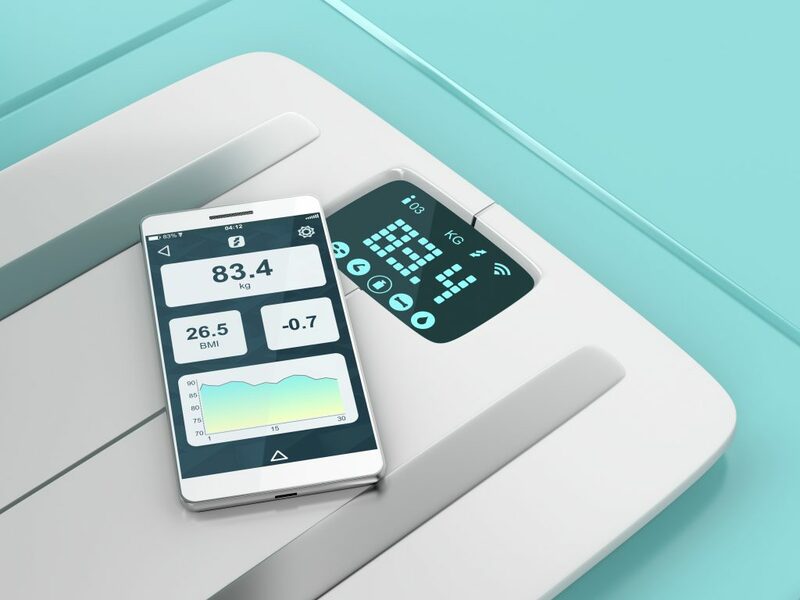 You might also see these devices called “wifi” scales, but it’s the same thing. We think of scales as being a tool to measure our body weight. At least, that’s what they used to do. That still perform that function today, but smart scales can do a whole lot more. What Can A Smart Scale Measure? BMI, or body mass index, is a value often used to determine someones health status. It’s really a ratio of our weight to height. The equation to find it manually is: BMI = mass (in kg)/height (in meters)². Or for us in the U.S. : BMI = [mass (in pounds)/height (in inches)²] x 703. BMI is often used to determine whether someone is overweight. According to the NIH, a BMI < 18.5 is considered underweight, 18.5 – 24.9 is considered healthy, and > 25 is considered overweight. BMI is ok for giving us a ballpark idea of overall health, but it has it’s flaws. Muscular folks can be placed in the overweight category because they weigh more, even though it’s lean mass. Lean folks are typically penalized for being “overweight”. Still not a bad metric to keep an eye on though. Body fat percentage is a measurement of how much of your total weight consists of fatty tissue. This includes essential fat and stored fat. This is a great measurement to consider when considering your overall health. Having a lower body fat percentage is typically the goal, but you don’t want to get too low because that is also bad for your health. Most “normal” men have body fat percentages in the 18-25% range. Most “normal” women are in the 25-31% range. Having lower values will make you look more lean and fit, however men shouldn’t really drop below 6% and women shouldn’t drop below 11%. These values make up the essential fat levels our bodies need for normal functioning. If you drop below these values, you run the risk of disrupting the normal function of your body. Definitely not something we want to happen. Muscle mass is kind of the opposite of body fat percentage. Muscle mass is how much of your total body weight is made up of muscle tissue. This metric might be beneficial to folks who are trying to bulk up and gain muscle. Sometimes it’s hard to tell if the weight you are gaining is fat or muscle (although looking in the mirror can give you some insight). Smart scales can give you an estimate of how much lean mass you have. You can also track this over time to see if you are reaching your muscle mass goals. Fat free body weight (also known as lean body mass) is you total body weight minus the fat weight. This might sound a lot like muscle mass, but it also includes stuff like bone weight and water weight. Some devices might actually differentiate between bone mass and water weight for those that are curious. Of course you have to wonder how accurate these values are from a scale you just stand on. But more on that coming up. These are the major metrics smart scales will calculate and track for you. Some scales may include additional calculations, but these are the most common. How Does A Smart Scale Work? The commercial smart scales we see in the store work by using something called bioelectrical impedance analysis (BIA). This basically means the scale can measure how much our bodies resist an electrical pulse. In order to pull this off, the scale actually sends a low grade electrical signal through our body and detects how fast it travels. Electricity will travel faster through the water and bone in our bodies than it will through the fat (less water content). Remember, that water is a great conductor. So, the more water your body has the faster the current will travel. Different body tissues contain different levels of water. When you step on a smart scale, you will notice it has 2 or 4 electrodes that you stand on. These electrodes send the current through your lower body and then analyze the results. Based on how fast this current travels, the scale can use different equations to estimate how much fat, bone, and muscle mass is in our body. Once these values are determined, the scale can send this information to whatever fitness app you are using for storage and tracking. Most scales will do this automatically every time you step on it. Your app will have different tools for tracking changes in this data over time and may let you set goals for yourself. Many scales are compatible with several fitness apps and some use their own apps. These apps are usually free. It’s a good idea to make sure the scale you are considering uses an app you are already using or willing to use. But How Accurate Are These Scales? This is a tough one and all smart scales aren’t the same quality. Like I mentioned above, these scales are “estimating” your fat mass and lean mass based on how fast electricity is traveling through your lower body. 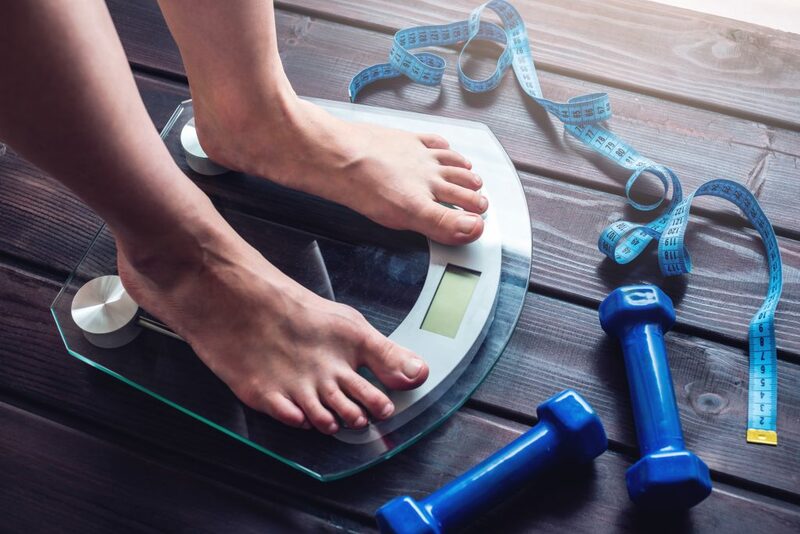 The scale is making an educated guess based on its readings, but there are several factors that can affect the results. Since these results are mostly based on water content, being dehydrated is going to affect the readings. If you are dehydrated, the electrical current is going to move a little slower. This is going to make the scale think you have more fat content than you do, which will cause a higher reading in your body fat percentage and a lower reading in your lean body mass. The opposite is also true if you just chugged a gallon of water. If your water content is higher than normal, you will get a lower reading on body fat percentage. Your body fat readings may be thrown off a little right after eating as well. If you get on the scale after having a meal, your body fat readings can read lower than normal. Not sure why, could be the increased liquid in your body? Checking your stats right after you exercise can also give you less reliable results. Exercising tends to increase our body’s electrical conductivity. This causes the current to travel faster, which the scale will read as less fat mass. Moderate exercise can cause a significant under estimation of your fat mass (and over estimation of your lean mass). We see that several factors can affect the readings we get from our smart scales. In order to get the most reliable results, you should weigh yourself at the same time and in the same type of clothing every time. Also try to stand with your feet in the same position on the scale for more accurate results. Whether you weigh yourself daily or weekly, try to keep the conditions the same. I would recommend weighing yourself first thing in the morning after you go to the bathroom. This way, you stomach should be empty and you haven’t consumed any fluids yet (dry weight). This is the easiest way to keep your conditions as similar as possible from weight to weight. FYI- scales with 4 electrodes are typically more accurate than scales with 2 electrodes. Are Smart Scales Worth Buying? Even though smart scales aren’t perfect with their calculations, they do have some value. Especially if you are into data tracking and like high tech gadgets. Even if the numbers you are seeing aren’t 100% accurate, they will still give you a ballpark idea of how you’re doing. They are also helpful for seeing change over time. Hopefully your scale will be reliably inaccurate- that is, it will err in the same manner with each reading. If so, at least the changes you see will be fairly accurate. And that’s the most important thing for fitness data tracking anyway. It’s being able to see the trend over time. It’s that change that we want to track. The actual reading day to day may not be that important- we want to see that we are losing weight or gaining muscle over time. And lets not forget that these smart scales still track our body weights too. If nothing else, these scales are handy for automatically tracking our weight for us. It’s pretty convenient to step on a scale every week and then be able to track your weights over time from your phone. But how much do these scales cost you may ask? They are actually surprisingly affordable. Most cost somewhere between $30 – $150. And a lot of highly rated smart scales are closer to $30 than $150. Smart scales these days really don’t cost much more than a non-smart digital bathroom scale. An extra $10 and your scale can be smart! Not a bad deal. Overall, I think smart scales are worth the investment. The cost is low and if you enjoy tracking data, I think you will appreciate what a smart scale can offer. If you don’t have a smart phone or use a computer, save the extra $10. A word of advice- when comparing smart scales, make sure you look at what apps that scale is compatible with. Different scales are compatible with different apps and some have their own app you have to use. Just make sure you are compatible with the product you are considering. Click here to see the best smart scales currently on the market. If you have any questions or comments, leave them below and I’ll get right back to ya.